WXXI's Karen DeWitt reports on the four-candidate race for state comptroller. 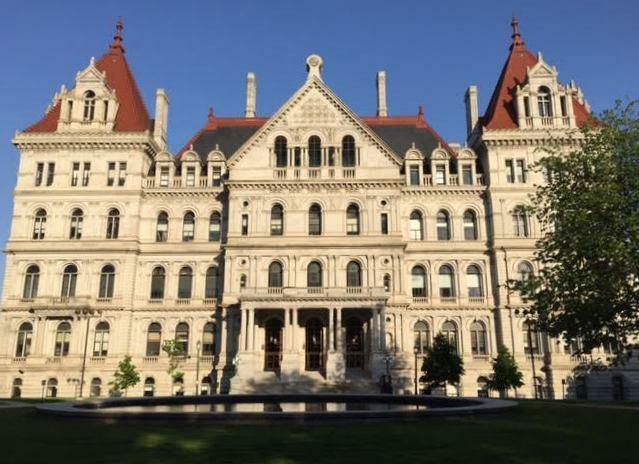 Among the statewide races, the contest for state comptroller often gets little attention from voters. But there’s still lots of interest in the post itself — incumbent Tom DiNapoli faces three challengers. DiNapoli has twice won election to the post, but he was first appointed to the position by the state Legislature in 2007, after the previous comptroller, Alan Hevesi, pleaded guilty to corruption charges. The post remains relatively obscure to most voters, and DiNapoli is still unknown to most New Yorkers. But he received the most votes of any statewide elected official in the 2014 elections, and he avoided the Democratic primary challenges that occurred this year in the races for governor and attorney general. DiNapoli said under his watch, the pension fund has grown by $100 billion. He also said he’s been a “steady hand” in state government and is independent, disagreeing even with the head of his party, Gov. Andrew Cuomo, on occasion. His Republican opponent, Jonathan Trichter, disagrees with some of DiNapoli’s investment decisions. He thinks DiNapoli has invested too heavily in risky hedge fund and private equity fund portfolios. He said the comptroller could have avoided billions in fees if he had just stuck to the market indexed funds. Trichter, a longtime investment banker, said he got interested in the state’s public pension fund when he covered the office’s investments for JPMorgan. He worked on the campaign of former Gov. Eliot Spitzer and helped on 2010 Republican candidate Harry Wilson’s campaign for comptroller. Trichter, who is still a registered Democrat, needed special permission under what’s known as the Wilson-Pakula act to run on the Republican ticket. Polls show Trichter is 30 points behind DiNapoli, but he said he’s undeterred. “I’m going to put my best ideas forward,” said Trichter, who added he’s a “fiscal pragmatist” with the right skill set for the job. “And then I’ll have to let the chips fall where they may,” he said. DiNapoli said Trichter is using selective data when he criticizes the costs and performance of the pension fund. He said Trichter looked at a 10-year period that includes the Great Recession, when every fund experienced a steep drop. He said that while some of the investments may include fees, the variety of investments is a plus. “Our strength is our diversification,” DiNapoli said. The Green Party candidate, Mark Dunlea, said he does not expect to win. He is focused on the issue of combating climate change, and he wants the comptroller to divest the state from all investments in fossil fuel companies. DiNapoli disagrees. He said he can do more to change the behavior of fossil fuel companies by remaining a major investor, and he said he’s done that. Trichter said he would “depoliticize” the fund and not use it for social or political purposes. There also is a Libertarian candidate in the race, Cruger Gallaudet, a former auditor for General Electric. Gallaudet, along with the other candidates, participated in a debate that aired earlier this month on Manhattan’s public access cable network. He said he’s not a politician. “What I would bring is a fresh pair of eyes,” said Gallaudet. He said he questions the size of the pension fund and the comptroller’s investment decisions. But Gallaudet somewhat undermined his candidacy when he said later in the debate that “we all know” DiNapoli is going to win the race.